This intensive two-day workshop is ideal for clinicians ready to delve deeper into implant dentistry and improve their understanding of and ability to utilize more advanced techniques in guided bone and guided tissue regeneration. Each participant receives instruction through in-depth lectures and hands-on surgical experiences utilizing anatomical models, as well as medical cadavers. Pre-requisite: It is suggested that participants have experience placing 10 or more implant cases. 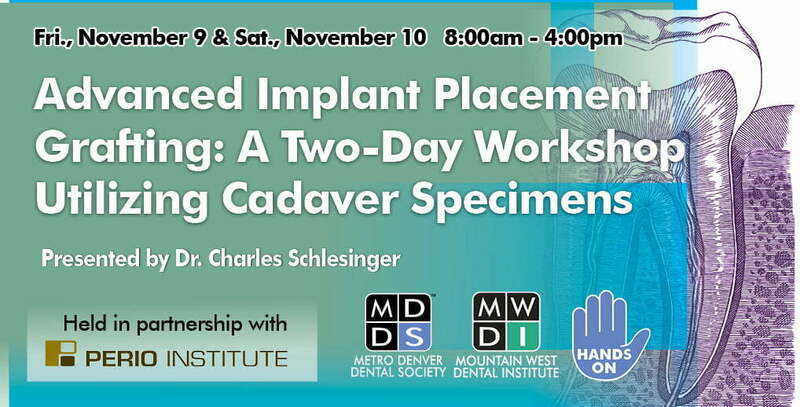 Dr. Charles Schlesinger is a dental implant educator and clinician who has been lecturing internationally for more than 10 years. He graduated with honors from The Ohio State College of Dentistry in 1996 and completed a general practice residency at the VAMC San Diego. He then became the chief resident at the VAMC W. Los Angeles. Dr. Schlesinger maintained a thriving restorative and implant practice in San Diego, CA for 14 years and now provides implant care at his private practice in Albuquerque, NM. In addition, he founded The CD Schlesinger Group to help practitioners gain knowledge and experience with implants and serves as a key opinion leader for The Hahn Implant System.